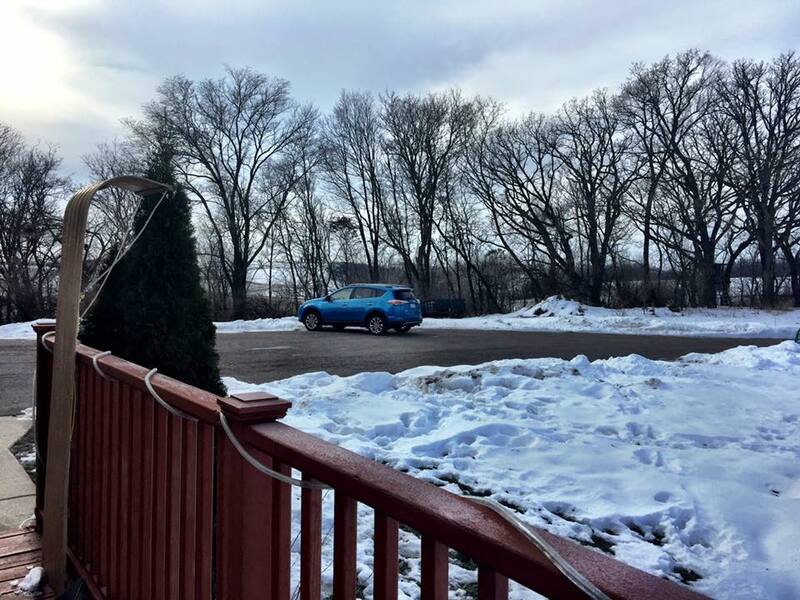 During our winter trip to Wisconsin, we wanted a vehicle that was good on gas, family-friendly, and fit for the winter roads of Madison and Door County. 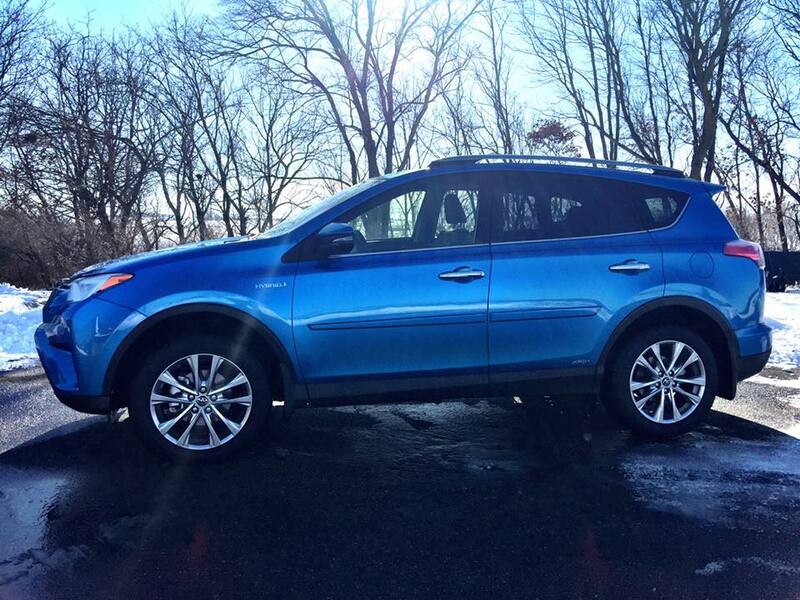 The RAV4 Hybrid Limited is stylish, fuel-efficient, safe, and comfortable. 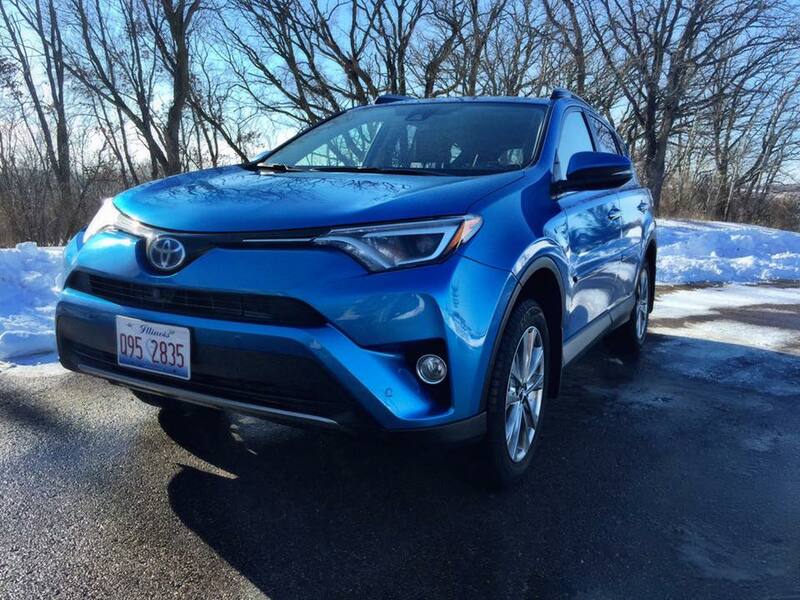 Overall, the RAV4 Hybrid is a compelling compact crossover with all the benefits of a traditional hybrid with few downsides. It’s perfect for a small family or a couple on the go. After years of living in California with limited winter road experience, we wanted a safe vehicle with a minimum of AWD. RAV4 Hybrid’s Electric On-Demand All-Wheel-Drive with intelligence (AWD-i) is designed to make any trek a sure-footed experience, with an electric motor that delivers instant torque to the rear wheels whenever you need more traction. We tested it out, again and again, on the huge hill leading to our accommodations. What better way to give it a run for its money than next to a sledding hill? We took turns driving and sledding with the kids. Since the hill was difficult to walk up after sledding, I drove the RAV4 like a taxi service, delivering everyone back to the top of the hill after sledding down. The wooden sled didn’t fit in the vehicle but we easily put it on the roof and piled everyone inside. It handled the steep hill perfectly, even when the evening approached and the ice began to cover the road. 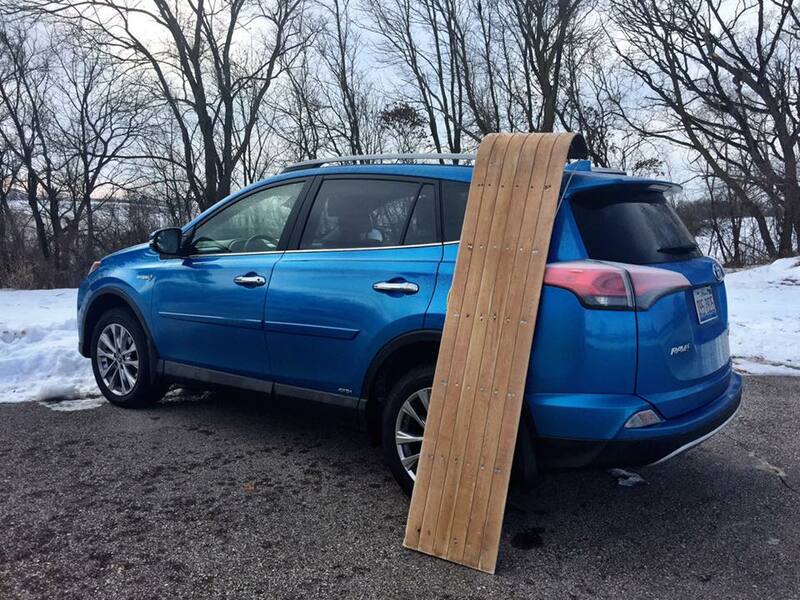 During long drives, like our trip to Door County from Madison, the Toyota Safety Sense™ P (TSS-P) came in handy. TSS-P bundles cutting-edge safety technologies, including Pre-Collision System, Lane Departure Alert, Automatic High Beams, Pedestrian Pre-Collision System, and Dynamic Radar Cruise Control. In addition to TSS-P, the Bird’s Eye View Camera with Perimeter Scan employs four cameras that are mounted on the front and rear of the vehicle and the side mirrors to project a panoramic view of the car’s surroundings on a central 7-inch touch display. The system offers driver assistance when parallel parking and when pulling in and out of parking spaces. 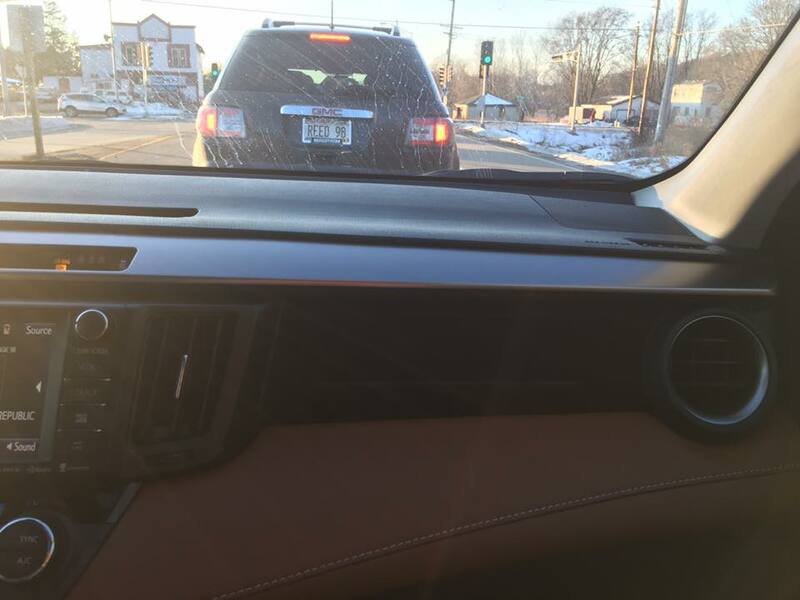 The The Bird’s Eye View Monitor system was ideal when driving around town in Door County. With snowbanks and obstructed views, the scan provided a live rotating 360-degree view around the vehicle. One of the not so obvious things that I loved about the RAV4 was the color, which made it stand out, or obvious, in a parking lot. Admittedly, I’ve wandered around parking lots far too many times searching for my vehicle. When you have a white car that looks like every other car in the lot, it’s impossible to find. I’ve gone as far as putting my key in the door of another vehicle before, thinking that it was mine. 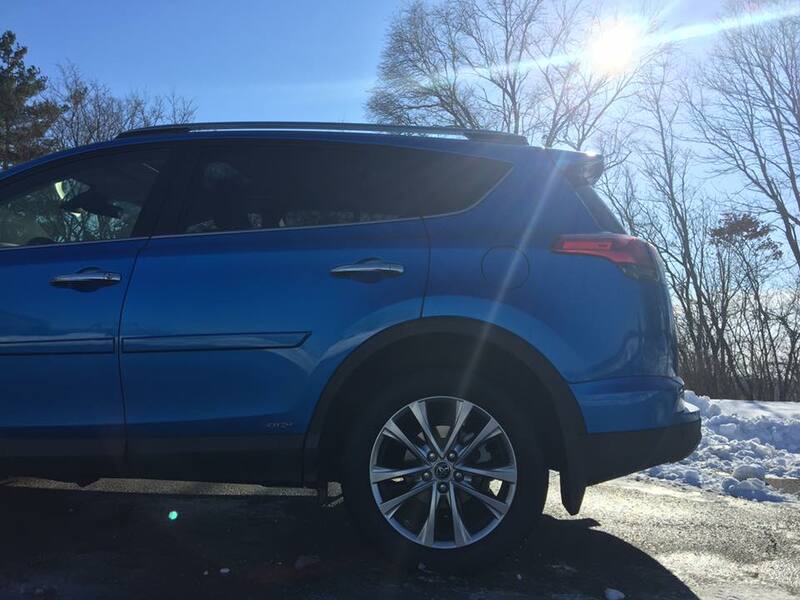 The RAV4 is a stunning, unique blue color that stands out in any lot. Another appreciated feature, especially for long trips, is storage space for small items like phones, drinks, and change. There is an open storage compartment on the passenger’s side and special cup holder design that that can accommodate a variety of travel mugs and cups, handle and all. There’s a special place for change/money; there’s a special spot large enough to hold your phone, and there are plenty of cup holders. We never had to fight for a spot for our stuff. The acceleration didn’t blow us away. It was rather slow to pick up and not especially sporty, but the overall maneuverability was secure and controlled. We also didn’t love the lack of vents in the back row. Athena was cold in the frigid temperatures of Wisconsin in December. A heating system in the back row would have gone a long way to warm her up. 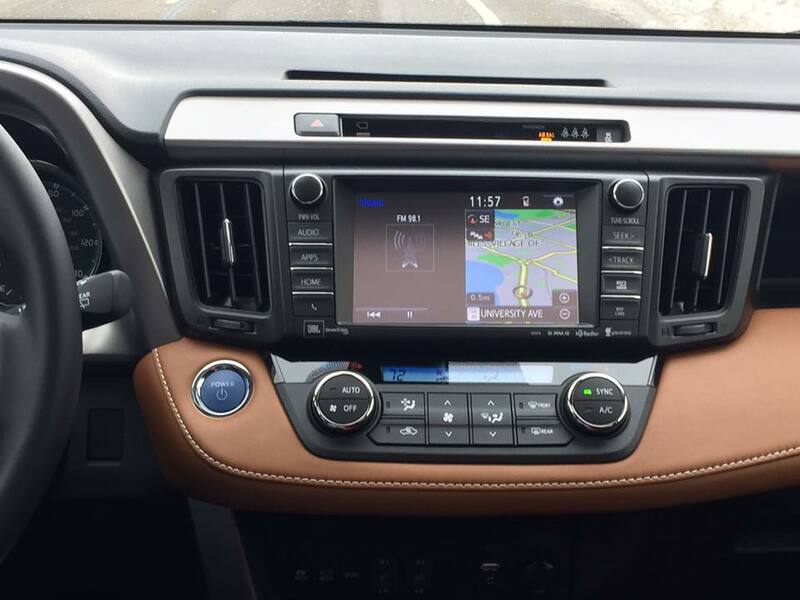 After spending more than 20 hours in the RAV4 Hybrid Limited, I can safely say that it is a comfortable, quiet drive. The driver and front passenger enjoy available heated seats and duel zone automatic climate control. The leather steering wheel has a luxurious feel and the second-row seats with a reclining, folding 60/40 split help expand your space. For a small family of three or a couple, it’s the ideal size for comfort and fun. What Makes Buick Enclave the Best Family Road Trip Vehicle?